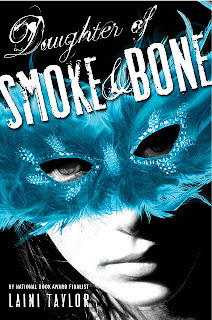 I have read a lot of great reviews about Daughter of Smoke & Bone by Laini Taylor. It has also been a good seller on Amazon, and since the library's copy has been checked out I broke down and bought the e-book for my Kindle. I have to admit, I thought it sounded a little too weird for me; a girl with blue hair, a monster who collects teeth, angels, devils - it just didn't sound like something I would love. However, the moment I started the book, I have been riveted to the story, and the romance between Karou and her angel, Akiva. It is the type of book that you are sorry to go to school or work, because you have to put it down! Publishers Weekly has this to say about the book: "Exquisitely written and beautifully paced, the tale is set in ghostly, romantic Prague, where 17-year-old Karou is an art student--except when she is called "home" to do errands for the family of loving, albeit inhuman, creatures who raised her. Mysterious as Karou seems to her friends, her life is equally mysterious to her: How did she come to live with chimaera? Why does paternal Brimstone eternally require teeth--especially human ones? And why is she "plagued by the notion that she wasn't whole....a sensation akin to having forgotten something?" When black hand prints begin appearing on doorways throughout the world, Karou is swept into the ancient deadly rivalry between devils and angels and gradually, painfully, acquires her longed-for self-knowledge". Great minds think alike! I just finished this one, too. What a great read...I want more! Me too, Jen - I was a little surprised at the cliff hanger ending!